Owlchemy Labs: VR is "too big to fail"
I've done lots of amazing things in virtual reality: scaled Everest, climbed cliffs while being attacked by dinosaurs, and gone eye-to-eye with a blue whale. The game I'm most looking forward to actually playing at home? Job Simulator, by Owlchemy Labs. I spoke to CEO Alex Schwartz and CTO Devin Reimer about their game and their commitment to VR as a platform. "We said Dyscourse is going to be our last game that's not VR, moving forward. So we're on the ship and if it sinks... we're committing to be a VR only studio moving forward. It's just so hard to go back once you've seen this brand new, completely different medium that we're at the forefront of. How could you go back to the olden days after that?" explains Schwartz. Reimer agrees, so much so that he admits that working with VR has started to spoil more standard games for him when he tries to play them for pleasure. "Literally every day we get to try something that probably no one else have ever tried to do before. I couldn't imagine going back to games where the space has been so defined where it's just like I can look over here and this game did this thing OK, that mechanic has already been proven. In VR it's way too interesting to stop," he says. "The amount of top 10, top 15 tech companies that are not making a play in VR is like one or two"
"I was playing Alien Isolation, which is a fantastic game but I kept running into this whole thing where I would come across tables and they would have all these really cool props from the universe and I wanted to do stuff with these but I don't have hands! The world started almost unravelling; it became this set piece instead of a thing I'm in and interacting with." Owlchemy spotted early on that VR was a horse it wanted to back and both Schwartz and Reimer are confident that it's going to be big, even if it takes a little while to build a large installed base. "The amount of top 10, top 15 tech companies that are not making a play in VR is like one or two so when you just look at all the big companies this is almost at a point where there's been enough money sunk into it, like that's your prediction... It's too big to fail," Schwartz motions to Reimer and laughs. "I tell people there's only two outcomes at this point; it's super successful and everyone wins or it initially fails and doesn't take off but then all the big players are like 'we have to throw enough money at it because we're so sunk into this that it does take off.' So I think we're past that inflection point," agrees Reimer. They also think that when it comes to VR sales consumer will be key to getting the word out. Schwartz predicts that early adopters will be putting out their headsets alongside beers and nachos in the near future. "It's going to be high-end VR at residential locations that sell people. We see the whole VR party thing forming naturally all the time. These are even single-player games. You look at something like Fantastic Contraption, it's a puzzle game that one person plays and never before has there been a single person puzzle game that anyone would want to watch someone else try to solve the puzzles. Yet when you're in VR and you're moving around it's like this performance and everyone comes around to watch." The sheer delight you feel playing Job Simulator is deceptive. Its simple premise (you're a robot learning about human jobs in an office cubicle, kitchen or convenience store) makes VR development look easy. The team actually started out adapting one of their standard games, base-jumping title AaaaaAAaaaAAAaaAAAAaAAAAA!! !, for a number of VR platforms. "I would say originally it took about one day to get it working in VR and it took over a month for us to get it polished enough that it was playable, which is kind of a theme in VR. It's relatively easy to get something to work, [but] it's really hard to get something good to work," says Reimer. And people said 'What are you talking about? That doesn't make any sense,' but it's pretty awesome because even our predictions of how fast things were going to move, we undershot. Things have actually moved even faster than I could have ever dreamed which is fantastic." "The 29 days was just removing elements. We'd put on the headset and go play the game and then something that [looked] good on a monitor, like you'd hit a building and it would spin you around as part of the mechanic, would [make you want to] throw the headset off! Nightmare! So we were just cutting away elements and realising that there was a core that could be used, but generally porting is very, very tough because you haven't built from the ground up for VR - so it's questionable whether there's even a nugget of usable VR content in there," adds Schwartz. "We learned that we should be building from the ground-up for new experiences for the platform while doing the AaaaaAAaaaAAAaaAAAAaAAAAA!!! port." 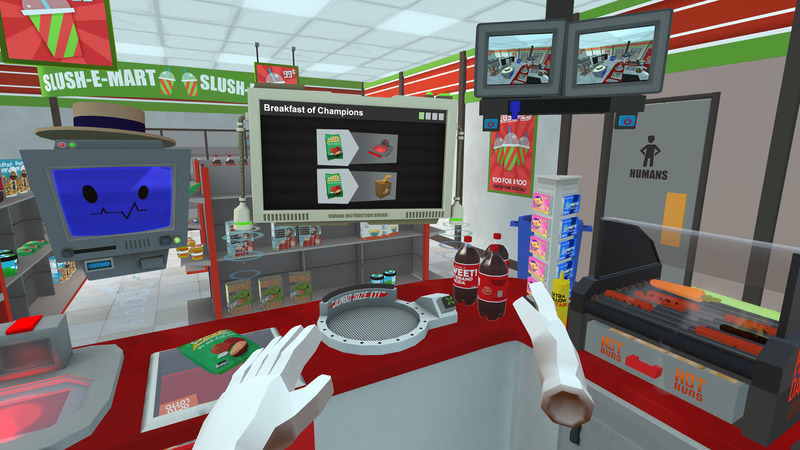 They point out that even simple elements, like menu systems, are actually really hard to adapt to virtual reality. They've skipped traditional menus totally for Job Simulator, and you exit a level by eating a burrito. No, really. "Everything has to be in the style of the mechanics of the game. So the first moment you come into Job Simulator we need to teach you that you have hands and you can grab, and that's the one button in the game you need to know. So we were like what do we do? Grab the start button? How is this going to work? And then we thought why don't we have our main character, Job Bot, hand you his card? And it's just floating there and so that first moment, intuitively, you learn how to play the game. Boom. And then you can throw the card away or do whatever you want and you've learned the core interactions," says Schwartz. They also applied this to another vital element of development, the storytelling. "So you grab that business card, you look at it and you're like Job Bot? Museum Curator? And so we try to do that a lot in Job Simulator. We don't try to bash people over the head with story or anything like that. It's all visual storytelling and we let people discover things for themselves." It's going to be a busy month or so for the Owlchemy team as launch nears; Job Simulator is a launch title for Oculus Rift, HTC Vive and PlayStation VR. As for the future beyond that, Reimer isn't even sure we can really conceive of it yet. "I think in four years... if I saw a VR game that would launch in four years today I don't think I would understand it. How does that exist right? We just know so little right now and what's actually really cool in VR."